Secondary parents were invited on Tuesday 6 November to listen to Daan Keiman from the Trimbos Instituut (non-profit organisation for mental health and addiction) and psychologist Nicole Buitenhuis presenting their views on preventing alcohol and drug abuse and positive parenting. 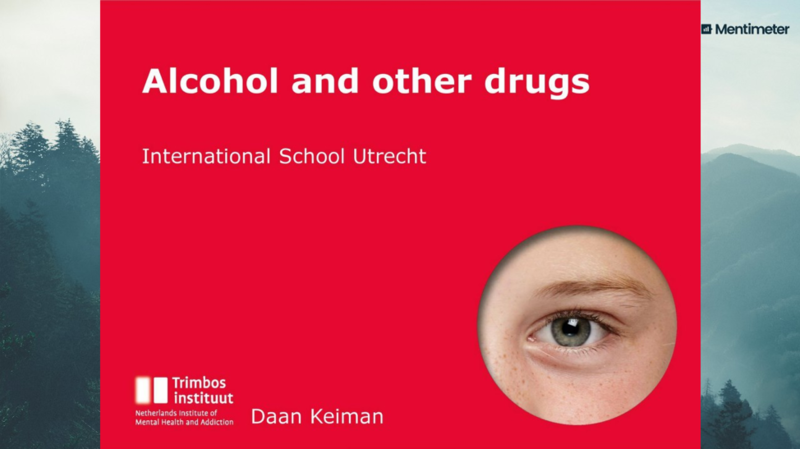 ‘I am going to talk to you about alcohol and other drugs’, says Daan Keiman. ‘You might be surprised to hear this, but alcohol is a drug like any other drug. 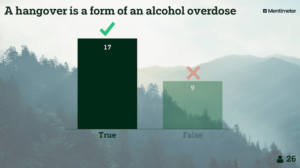 The only difference being that in the Netherlands alcohol is a legal and socially accepted drug.’ Parents are then asked to participate in an online quiz. The first task is to fill in the first word that springs to mind when thinking about drugs. ‘If I would ask your children this same question, I bet you the word “fun” would be right in the middle’, Keiman dryly remarks when the word web with the parent answers (‘scary’, ‘addiction’, ‘danger’ pops up. Having a 17yo old son and a 15yo daughter myself, I am really surprised as to how little I actually know about alcohol and cannabis. And I am not alone in this, lots of parents, it turns out as we continue the parent quiz, have misconceptions about drugs. 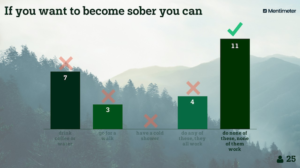 Statements like: mixing drinks makes you more drunk than drinking the same amount of one drink, a hangover is a form of an alcohol overdose, cannabis is addictive and cannabis is legal in the Netherlands, invariably split the audience. The above statements by the way are ‘false’, ‘true’, ‘true’ and ‘false’ (you can find all the questions and answers in Keiboom’s presentation). 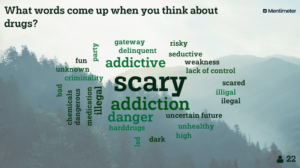 The fact that one teenager tries drugs once and is done with it, while the other becomes addicted depends on a wide variety of factors, including the kind of drug they take an how they administer it, their mindset and social setting. ‘As a parent you can influence what your children know about drugs, what they are exposed to and what you do yourself. If you for example drink a lot at home yourself, then that’s what your children are exposed to’, says Keiboom. ‘It is also good to be aware of the fact that teenagers have a much higher tolerance for the negative effects of alcohol and have a high learning capacity’, states Keiboom. ‘This means that when they find that after drinking alcohol they feel less down, or much more self-confident, alcohol will quickly become associated with very positive feelings.’ Having said all this, Keiboom is quick to reassure the assembled parents that although most teenagers at some stage will start to experiment, drinking alcohol, or using cannabis, this doesn’t mean that they will get addicted. ‘Don’t panic’, he says ‘ just make sure you listen and talk to your teenager and try and understand their world’. Nicole Buitenhuis couldn’t agree more. One of the cornerstones in her vision on positive parenting is communication. ‘Be and stay involved in your children’s life, be knowledgeable, be honest and take the time when they do want or need to talk’. So what if your teenager starts to experiment with alcohol and/or cannabis? Buitenhuis: ‘Stay calm and do not lecture or judge them, because if you do, the conversation closes down immediately. Instead ask them about their experiences (ask ‘how’ questions, instead of ‘why’ questions) and let them know you’re there to support them. You could for instance help them come up with ways to say ‘no’ to their friends, or tell them who they can talk to about their concerns if they are too embarrassed to talk to you’. I have to say that after listening to Keiboom and Buitenhuis I had a really good conversation with my 17yo son about alcohol (yes, he likes to drink a beer when out with his mates) and hash (he isn’t interested, but some of his friends are). By asking ‘how’ questions and refraining myself from lecturing him, he actually opened up more than he had in some time. In Keiboom’s presentation you will be able to find a lot more information on alcohol, cannabis, laughing gas and XTC. Should you have particular concerns, you could also call the Trimbos helpline on 0900 1995 (staff does speak English). You can also find lots of information on the Jellinek website. Ms de Villier ends the evening by asking the parents if they thought the school would facilitate parent sessions where parents of friend groups sit together to talk about alcohol and drugs. ‘These should be open and frank conversations’, she says. ‘It would be great if these sessions would result in some ground rules made by parents about for example the availability of alcohol during parties at home’. Since the audience really liked the idea, the school will try and come up with a way to make these conversations happen.